Whether your family owned a trampoline, or you begged your parents to jump on your friends, a trampoline was most likely a fun part of your childhood. Now, as adults, we want to give our kids a trampoline that will bring smiles to their faces, and keeps them safe. This Skywalker Trampoline is not your typical traditional trampoline. This trampoline is in the shape of a rectangle. The rectangle shape gives you a bigger bounce area. Even though the bounce area is bigger, it will distribute the bounce evenly. This trampoline will provide your family with hours of uninterrupted fun! This trampoline is great for gymnasts! You will get a great bounce from this trampoline that will distribute evenly. There is also a padded enclosure which will stop any spaces between the net and the jumping area. This trampoline is great for all ages too, because the weight limit goes up to 400 pounds! A young three-year-old up to your sixteen-year-old can play on this trampoline together! The safety features on this trampoline are above par with the latest safety gear all trampolines need. Of course, it comes with the mesh net that is made from polythene; it extends all the way up to the top of the poles. It has safety padding all around the springs of the trampoline so, no one should get hurt on that. Even the poles have safety padding on them. The frame of the trampoline is all made of galvanized steel. Galvanized steel is some of the strongest steel there is and that means the frame of this trampoline is really strong. This also makes the steel not rust which is nice if you’re going to keep the trampoline outside. They also added a UV protected spring cover which will not discolor in the sun. There is a foam padding on the trampoline to make it more comfortable. You can land batter with the rectangle shape of the trampoline. The poles are made of galvanized steel. Patented no gap enclosure of the trampoline. It can take a while to assemble the trampoline. If you have a small yard, this trampoline takes up a lot of space. The Skywalker brand is extremely popular in the trampoline space. They have put forth a superb quality product that the whole family can truly love. This trampoline is great for gymnastics. A lot of gymnasts buy this trampoline because they use this type of trampoline when they are training. The Zupapa trampoline is a heavy-duty trampoline here to ensure the safety and happiness of your children. Zupapa’s main priority is safety and you will be getting a trampoline that has great safety features and is made with strong equipment. This trampoline is made with galvanized steel so, it will sure to last a very long time. The weight limit is 375 pounds so even you can jump on the trampoline with your kids too. The Zuppa trampoline comes with six heavy duty galvanized steel steaks. What the steaks do is secure the trampoline safely to the ground. All you have to do is insert the steaks over the poles to insert them into the ground. These steaks are weather and wind resistant so you don’t have to worry about the trampoline flying around your yard. One of the nicest things about this trampoline is the fact that it’s so easy to use and setup. When you order this trampoline, it will come with a set of very detailed instructions to set the trampoline up. If that still has you confused, then you can always check online for videos on how to set it up. Another great feature is they send you a pair of gloves to use when assembling the trampoline. They also send a spring pull tool which is a tool you use to pull the string into their correct slot. This is good so you don’t cut your hard. The Zupapa brand also provides a strong galvanized steel ladder. The ladder not only stabilizes the trampoline as well as the steaks, but it also provides a way up into the trampoline. Not all trampoline companies provide ladders to their customers so this is a very nice touch that ties the whole trampoline together. Comes with a convenient ladder. Easy to assemble, comes with detailed instructions. Comes with a convenient rain cover. One of the more expensive brands of trampolines. This trampoline brand is a great buy because you get so many great features for this trampoline. The ladder, rain cover, and spring hooks really are a nice touch because other companies don’t send all that nice stuff. The price point is great and should last your family fun for years to come. The Orcc brand didn’t take long for it to rise to the ranks to be on our list of the best trampolines, but it did because of its superb features and quality. This trampoline brand comes in two different size choices, a twelve foot or a fifteen-foot trampoline. A great feature of this trampoline is it comes with six stakes so that you can stake down your trampoline so it won’t go flying everywhere. This trampoline is the easiest trampoline to set up out of all the trampolines I have reviewed so far. It takes up to an hour, 90 minutes at most to set it up. I am extremely happy that everything comes in an organized box with everything you need to assemble it. The instructions are easy to follow and easy to read! The Orcc trampoline comes with 108 heavy duty galvanized springs. Other trampoline brands have not added these many springs on a trampoline of this size. What happens when you add more springs is the trampoline has a higher bounce and it actually gives the trampoline more stability. When you have more than one person bouncing you will want to have a higher bounce, so everyone is experiencing the same high bounce instead of a sagging bounce. Awesome rain cover, ladder, enclosure net, and spring pull tool. 108 springs for a higher bounce. No safety certificates won for this trampoline. If you are looking for a solidly constructed trampoline that gives you a great quality trampoline to jump on then, this trampoline is a great choice for you to consider. This company tries to keep it very simple and easy for you to set up and they send you everything that you need plus extra goodies to have a great trampoline experience. The Orcc trampoline is a great value at a great price. The Giantex trampoline with the enclosure comes in six different sizes! It can come in 8ft, 10ft, 12 ft, 13 ft, 15ft, or in 16ft. That is huge for a trampoline! The main focus with this brand is about the quality and value. The price point is budget-friendly for each different size of trampoline. Get your kids off the tv and outside to play on the trampoline. One of the best things about this trampoline is that it is higher in length than other brands. For the 15ft Giantex is stands over 70 inches high. This provides the jumper with a great level of safety once the net is put up 70 inches high. The weight limit is high for this trampoline too at 375 pounds. Parents can play with the kids on the trampoline or a bunch of children can all play at once. One of the unique things about this trampoline is the fact that it has u-shaped legs. The legs are going to give you a 35-inch clearance off the ground. The legs are going to keep your trampoline stable. The Giantex brand gives you 90 springs and then as you go up in size you will get more. This will give you a bouncy bounce. The enclosure nets in the Giantex are actually attached to the steel poles. The poles are padded so if you bump into them you shouldn’t get hurt. The enclosure net has a clip and a zipper to close and open the net to get in and out. It’s simple, it’s easy to use, and its fun to bounce on. Low price trampolines with different sizes and different price points. Safety net goes up about twelve feet. The springs are located inside the enclosed net. This trampoline is not the best for flips and different gymnastics moves. If you are just going to use this trampoline for every day just plain jumping then this is a greatly affordable trampoline. The trampoline has a stable construction and will last years with the right care. The Jumpsport AlleyOOp trampoline is a great option for a family looking for a quality trampoline. This trampoline provides you with great bounce and can hold up to 270 pounds. That is enough weight for a few children or a child and an adult. It is made of galvanized steel and has a special patented variable bounce technology. This is one of the best trampolines for the outdoors. The Jumpsport AlleyOOP has come up with a unique piece of technology that has been patented. This technology is called the variable bounce, this is going to provide shock abortion when bouncing on the trampoline and it is also going to increase the bounce performance. This will give you a more forgiving jumping and landing because the springs take the fall energy for you. The trampoline comes with something called powder coating. What this does is coats all of the paint on the trampoline and protects it. When products are coated with this material can withstand elements better and last you a long time. Made of high-quality materials to withstand strong weather. Has variable bounce patented technology. The springs are connected by steel rings. Powder coating to keep your trampoline looking good. More expensive brand of trampoline. More time consuming to set up. This trampoline is wonderful because of the high-quality value you will get from it. You’re not just getting a trampoline; you’re getting something that will last for years, and give you and your family an immense amount of fun. I highly recommend this trampoline. The Skywalker company makes some of our personal favorite trampolines. The 10-foot round trampoline is a nice round trampoline with enclosure that comes with netting, pads, and safety zipper on the door. This is the type of best-rated trampoline people look for when choosing their first trampoline for their kids. The Skywalker brand makes extremely safe trampolines and this 10ft round trampoline comes with its own safety enclosed net and pads! This is so important especially if you have little ones that want to play on there. The pads will cradle them with support them if they fall on the mat while jumping. Trampolines are not required by law to have studies of safety tests done for their trampolines. One of the major things the Skywalker brand does is test their trampolines to make sure they are safe and meet a safety guideline. They make sure their trampolines are safe and durable before they start selling them. Dual zipper and clip closure. Comes in a few different color options. Smaller trampoline that only fits two to three people at a time. The Skywalker trampoline is really the most bought trampoline out of all the ones I have reviewed today. People buy this trampoline because of its amazing price point and because of the durability of the trampoline. It’s great for all ages of your family and makes everyone have a lot of fun. The Skywalker jump n’ dunk is a 15-foot round trampoline that comes with a basketball hoop and foam ball. You will still be getting all the top-notch safety features that the Skywalker brand provides. The basketball hoop is a really special feature not seen in many trampolines. This basketball hoop is attached to the trampoline so you can practice shooting or slam dunking! This trampoline is a ton of fun. Young children love this trampoline for many different reasons! One of the reasons being the basketball hoop the trampoline comes with. The trampoline has a built-in basketball hoop so you can jump high in the air and slam dunk balls right into the net. It does come with a foam ball so you can begin playing right away. The Skywalker brand is so innovative that they have a patented piece of technology. They were able to patent their no gap system which brings the net of the trampoline and the mat completely together. This makes it so people do not fall in between gaps of the springs. It in all honestly prevents people from getting hurt. They have also made a unique safe closure system on their trampoline. This trampoline will have a zipper but also have a latch clip. The latch clip just keeps the trampoline closed better and doesn’t allow for the zipper to come undone. The enclosure area is also padded with foam, this makes it even safer. Includes the basketball hoop and foam basketball. The trampoline meets the ASTM safety guidelines. T-bracket design and construction that provides stability to the trampoline. Only a 200-pound weight limit. If you want the ladder you will have to buy it separately. If you are looking for a 15 feet trampoline with the top of line safety features at a reasonable price then you have come to the right review. This trampoline is all of that and more. The added basketball hoop makes this trampoline so much fun. The Acon Trampoline comes in a 10 by 17 feet and can hold a weight limit of 300 pounds. You will be getting a heavy-duty trampoline that will withstand the weather elements without flying all over your yard. The company really thought about the springs and only putting the right amount to give you the best bounce. This the best trampoline for gymnast because of the incredible bounce performance they can have practicing. The Acon company really stressed the idea of not over adding springs. The reason they say this is because they believe each and every spring should work to its full potential when someone is jumping on the trampoline. So, they placed each spring specifically so that way each spring is optimized to give you the best performance bounce. The frame of this trampoline has been tested and changed to make it the strongest frame for this trampoline. They have designed a frame that is durable and stable on the ground. They also wanted to make sure no momentum would be lost when you are jumping on the mat. 100 square feet of bouncing surface. The spring pad is an inch thick and made with foam. The mat is also UV protected to not fade. Assembly can take up to five hours. This trampoline is great if you have a gymnast in the family that needs a lot of space to practice. There is 100 square feet of jumping space. You will have plenty of room to do tricks and jumps. This trampoline is more expensive than most brands but this trampoline is of high quality. You are paying for the quality and space on this trampoline. The Springfree trampoline is the most unique and safest brand of trampolines on the market. What makes them so unique is they are spring-free, being made of flexible rods. They provide your children with better safety because there is no space for feet to touch springs or fall through gaps. This trampoline comes in a variety of sizes and shapes, 8ft round, 10 ft round, 11 ft square, 13ft round, 13ft square, 8 by 11 ft oval, and 8 by 13 ft oval. All of the different sizes come at different price ranges. As the name suggests, their trampolines do not have any springs. They are made with high tension rods instead of springs. The rods are placed at an angle and work in unison with the trampoline to make a stable yet strong bounce. The Springfree brand is without a doubt the safest trampoline company out there. Their trampolines are built with high-quality materials. The net on the trampoline doesn’t have steel polls but uses flexible rods that actually keep the net in place better. The frame is made with strong composite rods. And the trampolines rods are covered in three coats of rust protectant material. This trampoline is also known as the best quietest trampoline. Usually, trampolines had a loud squeaky noise most likely from the springs. Since this trampoline has no springs the trampoline is incredibly quiet. No spring technology making it the safest kids trampoline on the market. UV resistant nets and mats. Good for all weather – weather durability. Oval shaped trampoline which is unique. No metal near jumping area. Net is attached to mat creating no gaps. Time consuming to set up. The spring-free brand is extremely impressive and they give you a lot of different options when choosing a trampoline. The biggest standout features when looking at this trampoline are the design and the safety elements that have been added to keep your children safe. The only negative thing about the spring free brand is that they are higher end so they cost more money than a traditional trampoline. When you factor what you’re paying for, you should consider this option because it is guaranteed to last years and years. The Merax is a cool looking green trampoline that is 14 feet and can hold up to 330 pounds. The trampoline comes with 72 strong galvanized steel springs that will provide you with a great bounce. This trampoline is not only great for kids but also for adults. It is incredibly safe and the best trampoline to give your kids as their first trampoline. This trampoline comes with a basketball hoop that is attached to the trampoline. It connects onto one of the polls and hangs right above the top of the net. the hoop is safe and secure and won’t come crashing down. The ball does not come with the trampoline but it will be easy to get one from your local store. The trampoline is made of a heavy-duty galvanized steel and comes with six w-shaped galvanized steel legs. This will provide your trampoline with a strong stable base. The ladder is also made of galvanized steel and will hold up the weight of people coming on and off the trampoline. The trampoline has a rust-resistant coating on the metal. Weight limit of 330 pounds. Galvanized steel with 6 w- shaped legs. Doesn’t come with the basketball. This is a great first trampoline for your children. It will keep them safe with its strong frame. This trampoline can withstand weather because the frame is strong and won’t go blowing around everywhere. This is a great trampoline for the whole family to have fun with. Trampoline safety is the number one factor to think about before you buy a trampoline. It’s only been a little over a decade since the majority of trampolines have started including safety enclosures. Nowadays, it’s uncommon to find a trampoline that does not come standard with one. There’s an even newer area of safety that has grown in popularity over the past few years, Springless trampolines. If you’ve ever jumped on a standard model, then you are probably familiar with the outer ring. The springs give the trampoline its bounce, but also increase the risk of injury. Even with an enclosure, it only prevents kids from hitting the edge or falling off the trampoline. This cannot prevent a leg or arm from getting caught through the gap. Make sure when buying a trampoline to always check out the safety features the trampoline has. If you buy a used trampoline make sure to inspect it thoroughly for any damage it might have. After safety, the most important factor is usually the price. Trampolines aren’t a small family purchase. You want to make sure your hard-earned dollars are going into something of great value. The shape, size, and overall quality will have the greatest impact on the price. A smaller size trampoline can cost you less but depending on how many people are going to use the trampoline will affect the price. Do you have two kids or four kids? Maybe you have six kids, or your kids will inevitably invite all their friends over. It’s critical to consider how many kids (or parents) will be using the trampoline most of the time. This will affect the size of the trampoline you purchase. The round trampoline is often thought of as the most traditional; it’s the one most of us remember growing up on. Round models tend to provide its jumpers with a softer and deeper bounce. Rectangular trampolines have historically been reserved for gymnasts, but that trend has changed. The rectangular shape will give the user a firmer and stronger bounce than its round counterpart. Square shaped trampolines are similar to the look and feel of the rectangular version. The oval and octagon hybrid shapes aren’t as common but act quite similar to their round counterpart. Not all trampolines fit into the same category. Some are only meant for indoor use while other products thrive in the outdoors. The backyard trampoline is your basic trampoline that is placed outside that your kids can play on. This trampoline is between 10 ft and 15ft and made of strong galvanized steel. They usually come with a net and zipper enclosure. The range from all different price points. The whole family can use the backyard trampoline. Small indoor trampolines designed for fitness called rebounders are becoming extremely popular. Trampolining fitness enthusiasts enjoy the high-intensity cardiovascular exercise of jumping on a trampoline. In addition to the cardio benefits, a trampoline workout also strengthens a lot of important muscles. Now that the world has become so technologically advanced, kids these days aren’t going outside like they used to. There are five main reasons why you should buy a trampoline for your children. Jumping on a trampoline is great exercise. When you are doing any sort of physical activity like jumping on a trampoline, your blood will start pumping throughout your body. This is good because it keeps you active. Bouncing is a low impact workout that will give your kids exercise and let them get all those wiggles out. Come on, let’s be honest here, trampolines are loads of fun. When you give your kids the gift of a trampoline, guaranteed they will want to stay home and play on it for hours. There are so many things besides just jumping, that you can do on a trampoline. 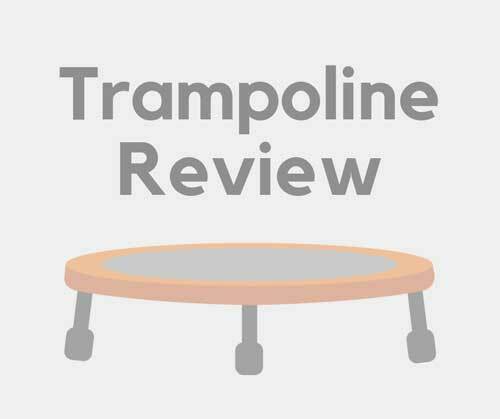 Check out our list of trampoline games that you can play when on a trampoline. Yes, jumping on a trampoline is extremely good for you. It helps you get exercise. When you are jumping on a trampoline you are pumping blood from your heart throughout your whole body. When your blood is pumping you are burning calories giving yourself a workout. Trampolines are fun. Trampoline make people happy when they are jumping on them. There are so many fun games to play on a trampoline and many kids can all play together on a trampoline. This will make you happy which in turn is good for you. How Does a Trampoline Work? When you bounce on a trampoline your feet are hitting the mat and the mat is being pulled tightly by the springs. The springs absorb the energy and extend. When the springs extend then the person who is jumping has an opposite reaction. The springs push you back and send you jumping in the air. When you are going to get a trampoline, you need to measure your space and see if you have enough room for one. Start at the metal edge of the trampoline and measure across to the other side. Now you need to measure it again but now perpendicular. Take the average of the two similar measurements and that should be the size of the trampoline you can get. Start on the shorter side of the trampoline and measure that. Now measure the long side which should be perpendicular from what you just measured. Take bother measurements and they should make up the dimensions of a rectangle trampoline. A man named George Nissen was the first person to invite anything resembling a trampoline. George was a gymnast in the 1930s and he and his coach created the first trampoline made out of inner tubing of tires. He wanted to create this to train other gymnasts on developing their skills further. They first started calling the trampoline, Campeon de trampoline. When Did Trampolines Become Popular? As we talked about above trampoline were invented in the early 1930s. there were mainly invented back then to help gymnast perform better. Trampoline got a redesign in the 1980s and the 1990s. this is when companies started to change the look of trampoline making them better for families and marketing them better. Today trampolines are so popular that most families have one right at home. The trampoline industry sells over half a million trampolines a year. The popularity of trampolines has grown so much that now businesses are opening up where people can pay to play on trampolines. Other types of trampolines have hit the market such as rebounders and toddler trampolines. Any of the best trampolines above would make a great choice for you and your family. All of these trampoline brands have proven themselves to be on the best trampolines list because of their safety features, stability, bounce, and design. If you have any questions about the trampoline brands above, please let us know what they are and we will try and get back to you as soon as possible. Have fun on your new trampoline!